Sierra Animal Shelter is owned by Sierra Veterinary Services and funded by the local municipalities and Sierra County. The City of T or C has received a Capital Outlay Grant to begin funding a Municipal Animal Shelter. The shelter is under construction with a possible opening scheduled for June, 2018. CAAT encourages adoption of shelter animals. CAAT helps by contacting pure-bred rescue organizations to foster pure-breeds at the shelter as well as to list adoptable animals on Pet Finders. 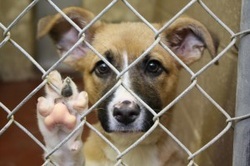 Last year more than 400 adoptable dogs and cats were euthanized at the shelter. If you are interested in volunteering at the new shelter contact Robbin Brodsky with Sierra County Animal Rescue Society (SCARS) at 575-895-5551. Rescue dogs make wonderful companions. Some have never had a home, others were abandoned or surrendered by their previous owners. Some are the victims of divorce, illness, allergies, a new baby, inexperienced owners, a move that didn't include them, and many other reasons. But most rescue dogs are loving animals who are grateful to have a second chance at a happy life. They can and do bond with their new owners, and become the most devoted and loving of family dogs. Rescue cats from shelters usually come fully vetted, spayed and neutered and vaccinated. They know how to use the potty box and are socialized to people. Many rescue cats have been socialized with other cats and can be successfully integrated into a household with other cats. Most of all rescued cats make wonderful pets. TNR is a program that traps feral cats, vaccinates, sterilizes and releases them back to the area in which they were trapped. This is a proven way to reduce the feral cat population. Ideally there should be one or more persons willing to provide food or water for a feral cat colony daily. If shelter is not available, inexpensive shelters can be constructed. This program has been proven to stabilize feral cat populations and then reduce them by preventing the birth of kittens. Cats that have been trapped and altered in a TNR program have their left ear tip removed so they can be identified if trapped again. Releasing them back to their original home territory discourages other feral cats from moving in. Alley Cat Allies has lots of information on TNR and ear tipping.